Her Marks, a Measure, Aura Satz’s first exhibition in New York, explores the role of women's labor in the history of astronomy and ballistics. In both fields women made significant contributions to observation, data collection, and computation. The exhibition, which includes video, lenticular prints and slide projections, was presented earlier this year at the Dallas Contemporary. Between the Bullet and the Hole is a film, co-commissioned by the Dallas Contemporary and the Sydney Biennale, focused on the elusive and complex effects of war on women's role in ballistics research and early computing. The film combines new and archival high-speed bullet photography, schlieren and electric spark imagery, bullet sound wave imagery, forensic ballistic photography, slide rulers, punch cards, computer diagrams, and a soundtrack by electronic musician Scanner. Like a frantic animation storyboard, it explores the flickering space between the frames, testing the perceptual mechanics of visual interpolation, the possibility of reading or deciphering the gap between before and after. Interpolation - the main task of the women studying ballistics in WW2 - is the construction or guessing of missing data using only two known data points. The film tries to unpack this gap and opens it to interrogation. It questions how we interpolate or construct the gaps between bullet and hole, perpetrator and victim, presence and absence. 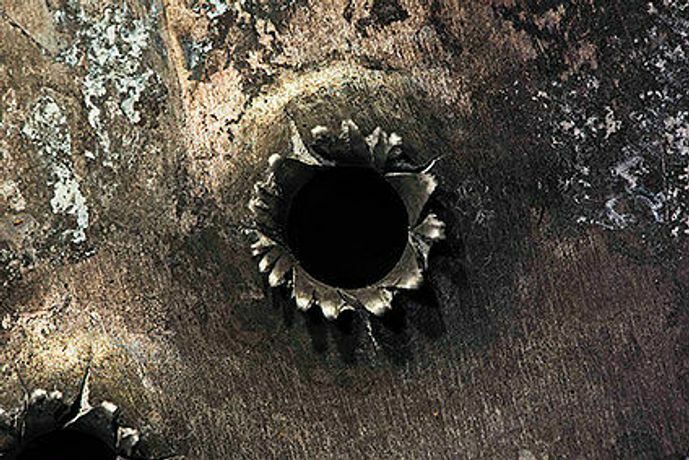 Between the Bullet and the Hole is a pair of lenticular prints depicting expanding bullets and crater-like bullet holes. The large circular prints are suspended from the ceiling facing each other, inviting the viewer to stand between them, as if in the path of the bullet that tore through. The exhibition also includes Her Luminous Distance, a slide-based installation featuring a device used by astronomers to detect small pattern differences between photographic plates by alternately switching between images, blinking back and forth between the two. Invented by amateur astronomer Ben Mayer, the PROBLICOM (Projector Blink Comparator) uses two juxtaposed slide projectors and a rotating disc to alternately obscure the images at a stroboscopic pace. The accompanying binaural soundtrack is a pulsing rhythmic drone, which plays on the perception of patterns. Her Luminous Distance honors the lesser-known women who contributed to important astronomical discoveries, in particular the women known as 'Human Computers' at Harvard who were engaged in painstaking astronomical observation and classification. Specifically, the work was developed from research on the pioneering deaf astronomer Henrietta Swan Leavitt (1868-1921). In her extensive studies of variable stars, Leavitt discovered the period-luminosity relationship, which ultimately helped calibrate a method to determine the size of the universe. The blinking slide sequence includes images drawn from Leavitt's original annotated photographic plates of variable stars, archival images from the ‘Human Computers' workplace, and a series of over 20 images of craters on the moon named after women astronomers.